William Andrews Clark Sr. (January 8, 1839 – March 2, 1925) was an American politician and entrepreneur, involved with mining, banking, and railroads. 3.1 William Andrews Clark Jr.
Clark was born in Connellsville, Pennsylvania. He moved with his family to Iowa in 1856 where he taught school and studied law at Iowa Wesleyan College. In 1862, he traveled west to become a miner. After working in quartz mines in Colorado, during 1863 Clark made his way to new gold fields to find his fortune in the Montana gold rush. He settled in the capital of Montana Territory, Bannack, Montana, and began placer mining. Though his claim paid only moderately, Clark invested his earnings in becoming a trader, driving mules back and forth between Salt Lake City and the boomtowns of Montana to transport eggs and other basic supplies. He soon changed careers again and became a banker in Deer Lodge, Montana. He repossessed mining properties when owners defaulted on their loans, placing him in the mining industry. He made a fortune with copper mining, small smelters, electric power companies, newspapers, railroads (trolley lines around Butte and the San Pedro, Los Angeles and Salt Lake Railroad from Salt Lake City, Utah to San Pedro and Los Angeles, California), and other businesses, becoming known as one of three "Copper Kings" of Butte, Montana, along with Marcus Daly and F. Augustus Heinze. Between 1884 and 1888, Clark constructed a 34-room, Tiffany-decorated home on West Granite Street, incorporating the most modern inventions available, in Butte, Montana. This home is now the Copper King Mansion bed-and-breakfast, as well as a museum. In 1899, Clark built Columbia Gardens for the children of Butte. It included flower gardens, a dance pavilion, amusement park, lake, and picnic areas. Clark later built a much larger and more extravagant 121-room mansion on Fifth Avenue in New York City, the William A. Clark House. He died on March 2, 1925, and is interred in Woodlawn Cemetery in The Bronx, New York City. Clark served as president of both Montana state constitutional conventions in 1884 and 1889. He is as rotten a human being as can be found anywhere under the flag; he is a shame to the American nation, and no one has helped to send him to the Senate who did not know that his proper place was the penitentiary, with a ball and chain on his legs. To my mind he is the most disgusting creature that the republic has produced since Tweed's time. Clark was married twice. His first wife was Katherine Louise "Kate" Stauffer (1844 Pennsylvania – 1893 New York). In early 1946 Anna commissioned the Paganini Quartet, and acquired the four famous Stradivarius instruments once owned by Niccolo Paganini for their use. William Clark donated 135 acres to the Girl Scouts in honor of his daughter, Louise Amelia Andrée, who died aged 16 of meningitis and had been very happy there. The Girl Scout camp in Briarcliff Manor was named Camp Andree Clark. Main article: William Andrews Clark Jr.
Clark's son, William Andrews Clark Jr., founder of the Los Angeles Philharmonic in 1919, left his library of rare books and manuscripts to the regents of the University of California, Los Angeles. Today, the William Andrews Clark Memorial Library specializes in English literature and history from 1641 to 1800, materials related to Oscar Wilde and his associates, and fine printing. Huguette (pronounced: oo-GETT), born in Paris, France in June 1906, was known as a reclusive heiress and was the youngest child of Clark with his second wife, Anna Eugenia La Chapelle. She married once, but divorced less than a year later. She led a reclusive life thereafter, communicating very little with the public including her extended family. She lived in three magnificent apartments, with a total of 42 rooms, on New York's Fifth Avenue at 72nd Street, overlooking Central Park. In 1991, she moved out of her apartment in New York and for the remainder of her life, voluntarily lived in various New York City hospitals. In February 2010, she became the subject of a series of reports on msnbc.com after it was reported that the caretakers of her three residences (including a $24 million estate in Connecticut, a sprawling seaside estate in Santa Barbara, California and her Fifth Avenue apartments valued at $100 million) had not seen her in decades. These articles were the basis for the 2013 bestselling book Empty Mansions: The Mysterious Life of Huguette Clark and the Spending of a Great American Fortune. by investigative reporter Bill Dedman. Her final residence was Beth Israel Medical Center, where she died on the morning of May 24, 2011, age 104. Huguette's extraordinary collection of arts and antiquities were consigned to go on the auction block at Christie's in June 2014, over three years after her death. Clark's nephew, Walter Miller Clark, son of James Ross and Miriam Augusta (Evans) Clark, along with Walter's wife, Virginia (McDowell) Clark, were passengers on the RMS Titanic. He was among the 1,514 who died on April 15, 1912 after the ship struck an iceberg at 2:20 a.m. She survived and arrived in New York City a widow. Some of Mr. Clark's personal items were retrieved during an expedition to the site of the sinking in 1994 in the debris field. They were identified by engraved initials. They included shaving soap, toiletry items, cuff links, and gambling chips. Walter's wife, Virginia, was rescued by the RMS Carpathia. 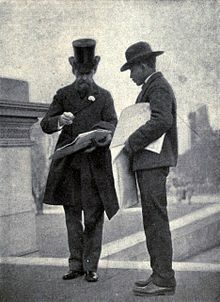 Clark's art collection was donated to the Corcoran Gallery in Washington, D.C. after his death, greatly enriching that museum's holdings of European as well as American art. The Clark donation also included the construction of a new wing for the Corcoran, known appropriately as the Clark Wing. The city of Las Vegas was established as a maintenance stop for Clark's San Pedro, Los Angeles and Salt Lake Railroad. He subdivided 110 acres into 1200 lots, some of which on the corner of Fremont Street in Las Vegas sold for as much as $1750. The Las Vegas area was organized as Clark County, Nevada, in Clark's honor. Clark's involvement in the founding of Las Vegas is recounted in a decidedly negative light by Chris Romano in the "Las Vegas" episode of Comedy Central's Drunk History, with Rich Fulcher portraying Clark. Clarkdale, Arizona, named for Clark, was the site of smelting operations for Clark's mines in nearby Jerome, Arizona. The town includes the historic Clark Mansion, which sustained severe fire damage on June 25, 2010. Clarkdale is home to the Verde Canyon Railroad wilderness train ride which follows the historic route that Clark had constructed in 1911 and home to the Copper Art Museum. ^ "Copper King William A. Clark". Copper King Mansion. Archived from the original on July 21, 2011. Retrieved July 31, 2011. ^ Dedman, Bill (2013). Empty Mansions (Paperback ed.). New York: Ballantine Books. p. 22. ISBN 978-0-345-53453-8. ^ Tribune Staff. "125 Montana Newsmakers: The Copper Kings". Great Falls Tribune. Retrieved August 28, 2011. ^ Huguette Clark, copper heiress and recluse, dies at 104, The Washington Post, Matt Schudel, May 24, 2011. Retrieved November 15, 2017. ^ Pitts, Stanley Thomas (May 2006). An Unjust Legacy: A Critical Study of the Political Campaigns of William Andrews Clark, 1888-1901 (PDF). University of North Texas: M.S. thesis. p. 205. Retrieved October 22, 2016. ^ Dias, Elias (1984). Mark Twain and Henry Huttleston Rogers: An Odd Couple. Fairhaven, Massachusetts: Millicent Library. LCCN 84062878. ^ "Senator Clark of Montana." In Mark Twain in Eruption, ed Bernard DeVoto, 1940. ^ "Daughter of Connellsville's controversial billionaire dies". The Tribune-Review. May 28, 2011. Retrieved January 6, 2017. ^ "Glendale Pioneers". Retrieved June 22, 2014. ^ "At 104, mysterious heiress is alone now - Business - Local business - Huguette Clark mystery - NBC News". msnbc.com. ^ "Eccentric Heiress's Untouched Treasures Head For The Auction Block", National Public Radio, Margot Adler, June 17, 2014. Retrieved June 22, 2014. ^ Gillan, Jeff. "Titanic sank 105 years ago this Saturday, taking a piece of Las Vegas with it". ^ Peterson, Hellen Palmer (May 2008). Landscapes of Capital: Culture in an Industrial Western Company Town, Clarkdale, Arizona, 1914-1929. Northern Arizona University: Ph.D. dissertation. p. 214. Retrieved October 22, 2016. United States Congress. "William A. Clark (id: C000454)". Biographical Directory of the United States Congress. 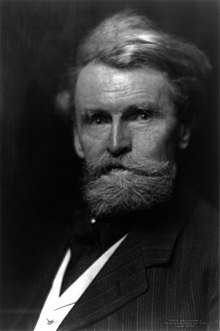 Wikimedia Commons has media related to William A. Clark. The following were members of the Society of Montana Pioneers which limited membership to individuals living in Montana on or before December 31, 1868.